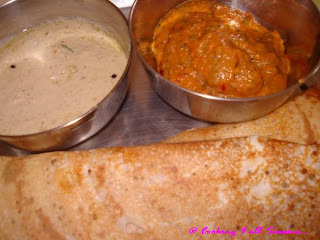 Cooking 4 all Seasons: Crispy Paper Roast Dosa with Tomato Chutney! The best dosa type in plain dosa, is thin paper roast ones. That is, if I can say that, other than Kal dosas. Actually it depends on what side dish you have and for that what dosa to make. Amma follows quite a number of proportions. But you get to enjoy those really crispy thin ones, roasted in ghee and served. Konda likes the crispy ones. So whenever a dosa gets fried, little too crispy I save that for her. Amma spreads out really thin ones, that there will not be any extra batter on the pan. But I sometimes have extra batter at few places which will be spongy and in most areas you will have those crispy areas which are roasted in oil. These are the things, that my daughter loves. She will sit and keep eating only that and not even bother about the side dishes that's been served. So I remembered this variety that Amma used to make and asked for the proportion. These really came out as thin as you want! In restaurants, you get served these as cones or as big ones. I remember when VIP Golden Beach was getting lot of attention because of its specialty dosas, sold in its restaurants. They were having these big family dosas, which will be enough for 10 people. Imagine sitting at a table and eating at the same dosa with your family. I used to think it was so funny but never had an opportunity to experience this. Two to four people used to bring this to the table and serve it for the customers. And the different chutneys that gets served. Yummy. I still find the red chutney that's served at Chains of restaurants like Sangeetha and Saravana Bhavan, very tasty. Its onion, tomatoes and red chili chutney but they have an unique taste to it. I haven't attempted reproducing it at home. My variety of tomatoes chutney comes out quite well. Infact, hubby dear got so bugged with Ground nut chutney that for quite sometime, it was only these onion or tomato chutneys that I was preparing. This tomato chutney recipe was given to my mom by her sister, who lived in Vizag for a decade. Not sure if its from Vizag but I got to know from my cousin, when she visited us, that this chutney is their favorite and that they eat with Rice too. I have never tried with Rice, though I love with crispy dosas. For basic details on dosa can be found here. Wash and clean the rice and soak for 6 hrs. Grind to smooth batter and let it ferment overnight. Its enough to add 3 4ths quarter of Fenugreek seeds as more of this will make the dosa look more brown. Few hrs before using, mix the batter again so that the salt gets mixed well. 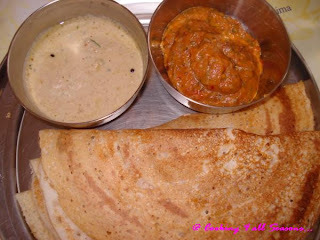 Heat a dosa tawa and spread a ladle ful of batter, as thin as possible. The consistency is such that you can get very thin ones. Sprinkle little oil or ghee for more taste. Chop onions and tomatoes. Heat a pan with oil. Roast all the ingredients in oil. Once its cool, grind to smooth paste. Temper this with the seasoning. Serve this with crispy dosas. My next dosa type in this series is Kal dosa! Anyone with explanations on what is Kal Dosa? Would love to hear them. Today is my dear friend's very special day. Lets wish her a very Happy Birthday! May all your dreams come true Bharathy!